You've seen the term "First Responder" in print or mentioned by a presidential candidate or two. These days, it's pretty broadly used, but it started as primarily an EMS title, complete with capitalization. What the term First Responder means depends on where you live, but it's probably not an ambulance or a person on an ambulance. An ambulance is necessary to transport the patient, but other medical responders can perform the first step. They're called First Responders, a term that's evolved in the media—especially since 9/11—to mean all emergency responders, but officially just refers to the medical folks who beat the ambulance to the scene. The most common first responders are firefighters, but there are other examples around the country, including single paramedics in Quick Response Vehicles (QRV's) or even on bicycles. Law enforcement officers can also fulfill the role of First Responder. Response times are often seen as the most important aspect of all three emergency services: law enforcement, fire suppression, and emergency medical services (EMS). It developed this way because emergencies in all three services can escalate rapidly and emergency responders might be able to do something to stop it if they get there in time. The police might stop an assailant from doing harm (or doing more harm than has already been done); the fire department might be able to rescue victims from a burning building; EMS might be able to resuscitate a person in ​cardiac arrest (one of a very small number of medical conditions guaranteed to result in death if not treated properly and quickly). Probably the most common reason that response times matter is because the public expects cries for help to be answered quickly and with a sense of urgency. We want to think of the ambulance screaming down the street with the lights flashing and the siren wailing. There is never going to be an emergency more important than our emergency. Most of the time, however, minutes don't count—at least not for ambulances. There isn't a single study that ties positive patient outcomes (patients getting better) together with ambulances arriving at the patient's side earlier. That doesn't mean someone shouldn't get there quickly, but it doesn't have to be an ambulance. Several variables affect response times—traffic, geography, mechanical failures, dispatch procedures, etc.—but the most important variable is the availability of resources. If there is always an ambulance sitting ten minutes away from you when you call 911, any emergency call could receive an ambulance within ten minutes. It’s a simple rule. Always having those ambulances available would result in getting to the scene within ten minutes 100 percent of the time. The only way to make sure responders were always there on time would be to flood the system with resources. That doesn’t happen because resource availability costs money. Each hour of availability—what is usually referred to as a unit hour—has multiple expenses associated with it: crew wages, fuel, wear and tear on the equipment, equipment procurement costs, training costs, etc. This creates competition between the fiscal realities of cost and the expectation of service by residents. Instead of the obviously expensive option of adding more unit hours to the system, it is possible to squeeze more production out of each unit hour by improving efficiencies. If each ambulance could answer more calls for service per hour, the need for additional resources is eased. It becomes a balance that can be seen in a system that is properly managing its resources. For this reason, many municipalities measure response times as a proxy for the health of the EMS system. The lower (AKA faster) the response times, the better the system is performing. 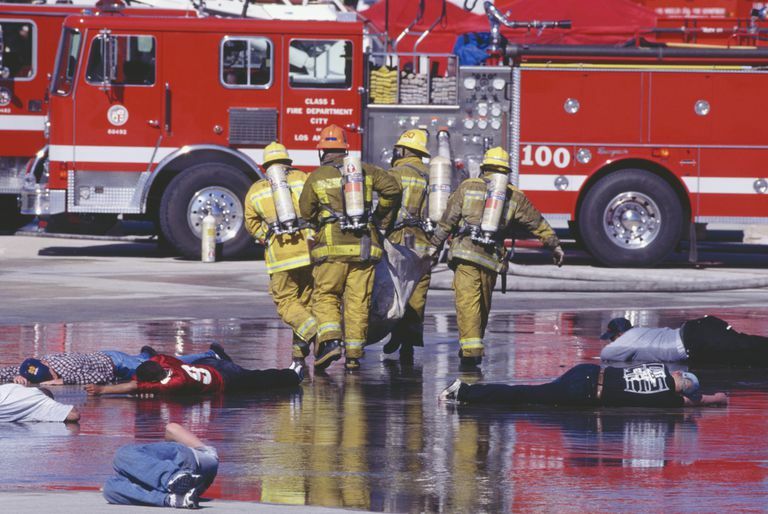 Should First Responders Be Paramedics? Speaking of money, there is a debate in EMS about which is the better First Responder, an EMT or a paramedic. Advanced life support (ALS) First Responders have a paramedic on board and basic life support (BLS) First Responders have an emergency medical technician (EMT) on board. Paramedics are more expensive. The small list of procedures that really has to be done within minutes of the onset of a medical emergency (CPR, defibrillation, bleeding control, epinephrine administration, and positive pressure ventilation) are all procedures that can be performed by EMT's. Once these things have been started, the emergency has been halted, or at least slowed. The patient almost certainly needs further treatment and transport to definitive medical care, but a few extra minutes won't make much of a difference at this point. First Responders need to be close by (which means we need a lot of them) and available to respond fast when you call 911. Using BLS first responders helps make it affordable. Patient’s heart stops adequately pumping blood (cardiac arrest). Bystander calls 911 and begins CPR (Bystander CPR, a form of BLS care). Medical responders arrive and continue performing CPR, now with the addition of rescue breathing (BLS care, which can be performed by BLS or ALS First Responders, or any ambulance, and should be started within five minutes of the original dispatch). Medical responders place a defibrillator on the patient and shock the heart (BLS care, which can be performed by BLS or ALS First Responders, or any ambulance, and should be started within five minutes of the original dispatch). Medical responders start an intravenous line to provide fluid and medications (ALS care, which can be performed by ALS First Responders or ALS ambulances, and should be started within ten minutes of the original dispatch). Medical responders place an advanced airway to ventilate the patient (ALS care, which can be performed by ALS First Responders or ALS ambulances, and should be started within ten minutes of the original dispatch). Medical responders provide medications to the patient (ALS care, which can be performed by ALS First Responders or ALS ambulances, and should be started within ten minutes of the original dispatch). Medical responders prepare the patient for transport to the hospital and load the patient into the ambulance (requires an ambulance, which should be available at the patient’s side within fifteen minutes of the original dispatch). The first two steps happen before responders arrive. Steps three and four can be done by any ALS or BLS responder, ambulance or fire engine. Steps five through seven require paramedics and must have ALS responders, a fire engine, or an ambulance. Step eight needs an ambulance. Not always using paramedics might sound like a decrease in medical care, but in 2005, USA Today published a five-part series illustrating that EMS systems with fewer paramedics actually had higher survival rates for cardiac arrest. If you call 911 for a medical emergency, don't panic if the person you were expecting doesn't show up at first. A first responder knows how to help. Sanghavi P, Jena AB, Newhouse JP, Zaslavsky AM. Outcomes of Basic Versus Advanced Life Support for Out-of-Hospital Medical Emergencies. Ann Intern Med. 2015 Nov 3;163(9):681-90. doi: 10.7326/M15-0557. Epub 2015 Oct 13.